A field of lights indiscriminately spans across the remains of the Prussian Castle and Palace of the Republic. The competition task is based on a self-created dilemma. The demolition of existing buildings ended the interim use of the Palace of the Republic before there was any clarity about when new construction would begin. The result is a fallow area that will last for 5 or more years. The competition envisions a temporary design and use of the ground to bridge the interim gap without using significant existing structures or giving impulses for long-term new design. This bears the risk that the special character of the site will be masked due to the widespread tendency to focus on spectacular leisure “events”. After the demolition of all aboveground buildings, the surface shows traces of the antithetical designs of the site in the course of history and is a cartography of a societal and historical field of tension. Nothing would be more foolish than to cover these signs with grass: the ruins of the foundations of the City Palace and the Palace of the Republic, the traces of the demolition, the asphalt surface of the bleak forecourt, etc. We propose to accept the contradictoriness, rawness, and incompletion of the site and not to change the existing surface. The Palace trough with its sand filling will be no more covered than the foundations of the Palace. Local interventions will be restricted to what is absolutely necessary to ensure traffic safety on the entire surface. 125 temporary lampposts define a space. 20-meter steles of polished steel stand in a 20m x 20m grid. The field of lampposts marks the site and thus provides orientation and location in the urban space fragmented by the demolitions of the last 65 years. The light volume organizes and structures space with a minimum of means and physical presence and thus addresses an urban space problem that, after the deconstruction of the Palace of the Republic, will be even more urgent than today. From the direction of the street Unter den Linden (i.e., from the West), it will be possible to see the disappearance of the building, which many regarded as ugly, as a liberation; the Red City Hall will now be visible, with a large green area in front of it. But the situation looks very different from the East. The still intact urban construction ensemble of the design of the center of the German Democratic Republic (East Germany) will lose its spatial completion on one side. After the demolition of the Palace of the Republic, one looks to the West into a diffuse, frayed urban landscape. The volume of light gives it contours again. The light field overarches the remnants of the City Palace and the Palace of the Republic, new construction, demolition, and interim use without distinguishing between them. The selective intervention leaves the surface structure of today’s Schloßplatz untouched and only minimally affects the possibility of using it. For this reason, the field of lampposts can be realized in full extension from the start and does not stand in contradiction to excavation work, subway construction, or the erection of an Info-box. As needed, individual lampposts can be left out or removed in order to permit necessary work. The illumination of the lamp field is dynamic and interactively controlled. Each lamppost can be individually switched. Depending on local factors like the presence of persons, the temperature, noise, air humidity, etc., the illumination of the field changes. The field of lamps can also serve to shed light on external factors and information. - Every use by private persons or nonprofit initiatives that lasts no longer than 72 hours, that is realized by persons without mechanical aids, and that conforms with the general legal regulations (for example, those pertaining to traffic safety) is in principle permitted. - Beyond that, temporally limited cultural uses are also possible. For such uses, a proposal should be presented to a board of trustees that decides on this use within three months. The board of trustees can be created anew or be an existing body (for example, the Council for the Arts). - All uses are public and open free of charge. Advertising and commercial uses are prohibited. The differing characteristics of the site’s surfaces (sand, grass, asphalt, construction remnants, etc.) and spatial situations (facing the street or the water, flat or sloping, etc.) will result in a diversity of uses. The character of the uses can extend from the everyday to the extraordinary. The uses that develop will be documented. The research association Urban Catalyst developed out of the European research project of the same name on strategies for temporary uses on urban fallow spaces (2001 – 2003) and was founded by Philipp Misselwitz, Philipp Oswalt, and Klaus Overmeyer in 2003. Urban Catalyst is a co-initiator of the cultural interim use of the Palace of the Republic by the project ZwischenPalastNutzung/Volkspalast (interim palace use/people’s palace). In November 2002, it presented a first feasibility study on this and showed alternative ideas for dealing with the site at the exhibition and symposium “Demolition and then? – X Ideas for Berlin’s Schloßplatz“ in July/August 2005. In February 2006, Urban Catalyst presented a proposal for the use of the underground levels of the Palace of the Republic after the demolition of the aboveground building. 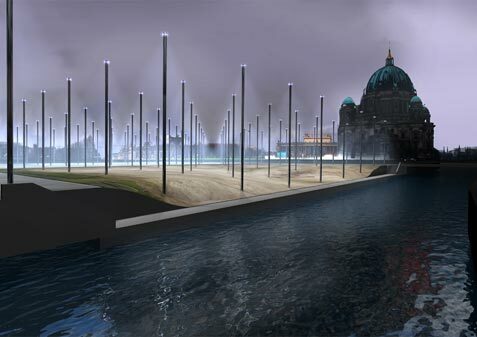 This proposal is being shown in the German Pavilion (ConvertibleCity) at this year’s Architecture Biennial in Venice. The project ZwischenPalastNutzung/Volkspalast received the European Prize for Public Space/Jury’s Special Prize in June 2006.